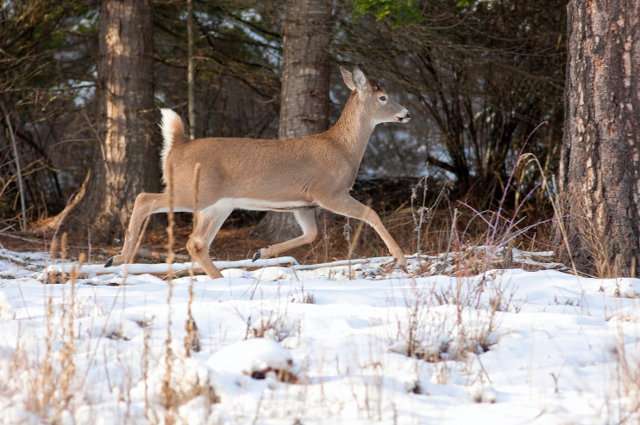 How do deer survive harsh winter weather? White-tailed deer, the kind found in Massachusetts and across most of the United States, are the widest-ranging ungulate in the Americas, from as far south as Bolivia to as far north as southern Canada. To cover such diverse territory and climates, white-tailed deer have a variety of adaptations and behaviors, including those that allow them to survive harsh winter weather that is common in New England. Like many other mammals, deer physically prepare for the winter by better insulating their bodies. In the fall, deer gradually trade their summer hair coat for a winter one, which consists of thicker, longer, and darker hairs called guard hairs, while also growing in a much thicker undercoat. This winter coat absorbs more sunlight and traps more body heat than the summer coat, and provides an extraordinary amount of protection from the cold. Deer also have oil-producing glands in their skin that help make their hair water repellent, which is especially valuable in the snow. For further insulation, their bodies also begin to retain more fat in layers during the fall. Deer also alter their behavior to survive the winter. They are generally less active, sometimes dropping their metabolism by half, which allows them to save energy and eat less. Deer may physically hunker down during particularly harsh weather—not moving for days, even to eat— which is made possible by relying on their fat stores. Deer also typically seek areas that are more sheltered in which to rest and eat, such as stands of coniferous trees that maintain their needles during the winter and allow snow to build up, both of which help provide some wind resistance and possibly cover. These areas, sometimes known as "deer yards," may encompass many—if not hundreds—of acres, providing shelter for lots of deer. Usually deer can comfortably survive the winter by eating their usual diet of twigs, stems, grasses, and other plants wherever they typically would find them, as well as by supplementing with higher-calorie foods such as nuts, fruits, and even mushrooms. Because deer are generally browsers, like goats, and not grazers, like cows or sheep, they do not need to get under the snow to eat, though they can and sometimes will.